Since 9/11, the public spotlight on American Muslims has been intense, and much of the time the exposure has been negative. The level of scrutiny on American Muslims has increased over the years, particularly since 2010 when Florida-based pastor Terry Jones sought to burn the Qur'an publicly; a national controversy erupted over plans to build a Muslim community center near the World Trade Center; and Louisiana and Oklahoma adopted anti-Islam legislation seeking to prohibit Muslims from practicing their faith. Adding its unique voice to the growing chorus of research on anti-Muslim prejudice, the Institute for Social Policy and Understanding (ISPU) has launched a new project, Islamophobia: A Threat to All. The project's focus is providing research that is relevant to American Muslim advocates, community leaders, and their allies. 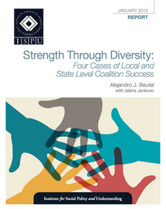 This specific community brief, Strength Through Diversity: Four Cases of Local and State Level Coalition Success highlights and explores four (4) cases of successful advocacy in coalitions.